NOTICE: Sorry, but as of 12/1/03, I'm putting a hold on sales of the Nail Melter Tool, however, I will continue to sell replacement tips for prior customers. Please check back again to see if I'm selling the Nail Melter Tool again. So many of the iguana owners that try out this tool, quickly realize that it's truly superior to regular nail clipping. The tool allows you to reshape and dull down the sharp toe nails without any bleeding or pain like you get with conventional nail clippers. With the push of a button the tool's tiny little skinny thin wire tip is immediately activated and glows red. It nicely melts down the point or ending of the toe nail. It really does not matter how long a toe nail is just so long as it does not have a sharp point or edge. It takes a little practice but this is a great alternative to the pain and fear iguanas have with common nail clippers. sometimes you can use this tool on the iguana's toe nails without him or her even noticing. It takes about one to two seconds to reshape each nail point. 1) Do not use the tool near anything flammable. 2) Keep the tool out of reach of children. The Electric Iguana Nail Trimming Tool includes 2 high quality rechargable batteries with charger, plus a spare replaceable wire tip. NOTICE: The old AC plug-in model has been superseded by the battery-powered model utilizing new high powered rechargeable batteries and charger. The newer high powered rechargeable batteries actually deliver more power to the nail trimming tip than the old AC plug-in model. And there is absolutely nothing the old plug-in model does better when using the high powered rechargeable batteries in this tool. The AC plug-in model is no longer available. If you are not satisfied with the Nail Melter Tool for any reason, let me know, then send the Tool and other parts back for a full refund. Do not try to cut through the toe nail, rather, ever so gently and just barely touch the red hot tip of the tool to that sharp end point on the toe nail in order to melt and reshape it down toward a dull rounded finish. It generally does not matter how long a toe nail is just so long as it does not have a sharp edge and point on it. This method is so quiet and easy on the toe nails that you can sometimes use it without him or her even noticing. Keep in mind, the iguana may begin to feel a little heat depending how you use the tool but this is not a serious problem. Just be observant as to how the iguana reacts as you go along and let that help guide you to use it better. It may help to have someone else hold the iguana while you work on the nails. It only takes a second or two (depending on the size of the nail) to melt/shape each toe nail. With a little practice, you get the hang of it. Keep in mind, this tool tends to be more practical for use on larger toe nails (larger iguanas). The toe nails on the baby iguanas (below the age of 7 or 8 months) are rather tiny, so the tool may trim them down a bit too quickly and you end up trimming more than you need to or want to, but as long as you do make the effort to be EXTRA careful, it can be used on baby iguana toe nails without a problem. In most cases, young or baby iguana toe nails are usually not that much trouble and don�t have to be trimmed. As the iguana and his nails grow toward larger sizes, the nails really do need to be trimmed and kept under control if you plan on doing any handling of the iguana. 1) Find a comfortable place to work on the iguana. It may help to wrap a towel around the iguana for more control in keeping him still in place. You can expose just one foot at a time to work on. Blocking his view of the nails that you are working on may also make it easier. 2) Test the unit: Remove the cover tube to expose the wire tip. Push (gently) on the power button and see if the wire tip glows red hot (which should occur almost instantly). When it gets red hot, it�s ready to use. 3) Lightly, carefully, gently! Just barely now, touch the tool's hot tip to the sharp end point of the toe nail. Don't worry if you see or smell some nail material smoke, that is normal and not a problem. Use the tool in a such a position or angle that avoids getting any of these fumes or smoke into your eyes or nose. NEVER PUSH or FORCE the tip of the tool against the nail or you will bend and damage the wire tip. Go ahead and carefully melt the point of the toe nail down just enough to make it dull and blunt so there is no longer a sharp edge. Then move on to the next toe nail. By the way, the unit is delivered with one extra wire tip (the heating element), but if you ever need more tips, they are $7.50 dollars each, (which includes shipping). WARNING: When you slid the cover tube back on to the unit, be sure the cover tube is not pushing down on the power button. If the power button is stuck on, the unit will melt down and could cause a fire. Another method of safety prevention is to simply pull the wire tip off (out) of the unit when not using it. When you need to use it, just plug the tip back in to the front of the unit. It pops on or off very easily as you grab hold of the white plastic part of the wire tip. Don�t leave the Nail Melter tool where any children can get to it!!! The Nail Melter tool comes with a NI-CAD battery charger along with two "AA" size NI-CAD batteries (that recharge up to 1000 times!). The NI-CAD batteries provide much more power than conventional batteries, actually gives it more "glow" at the tip, that's more nail trimming power/heat, to do a faster or better job. 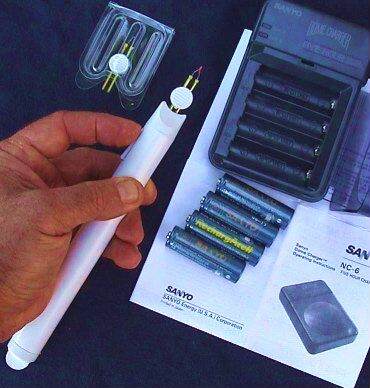 The tool is delivered with two AA conventional type batteries already installed, try those first and if you want more nail trimming power, remove them and install the Ni-Cad batteries instead. ***Never attempt to charge conventional batteries in the charger supplied with this tool, only charge Ni-Cad batteries.